Mary Vecellio C’18 knew she had a story to tell. But she wasn’t sure how to sell it. Sure. She had an idea. But if that idea was going to be successful, she had to make sure that others — others who spoke a language very different from that which she was accustomed — could also see her vision to tell that story. To complicate matters further, this was no simple story. She was chosen to tell the world how Winston-Salem became known as the City of Arts and Innovation. And she had to be able to tell that entire story in the time it took someone to travel a mere 22 steps — a single flight of stairs. Alyson Francisco, Director of the Center for Women in Entrepreneurship and Business was hard at work attempting to acquire Salem’s first off-site workspace in 246 years, when Vecellio entered the picture. Francisco was completely immersed in efforts to move the soon-to-be renamed CWEB to the 3rd floor of Winston-Salem’s newest downtown entrepreneurial test ground when she heard that the leaders of Winston Starts were looking for a student visionary. As fate would have it, Francisco recalled a business card she had just gotten from a Salem art student, and she put in a call to Vecellio. Winston-Starts, a non-profit organization that supports startups at all stages of development, was looking for a student artist to paint a stairwell mural between their two floors — something that would inspire young entrepreneurs and connect them to a future of possibilities. Basically, they asked if I could do a mural that represented the growth and innovation,” said Vecellio, who is no stranger to thinking big in her art projects. Vecellio’s concept would be pretty simple — an idea, which would be represented by a metaphorical light bulb would be planted. And with water and nurture, that idea would grow up the stairwell and ultimately result in the Winston-Salem skyline — a city where ideas can flourish. When local businessman and visionary Don Flow bought the former GMAC Insurance building, now named 500 West 5th, his goal was to create a space where local innovators and entrepreneurs could start their businesses in friendly and nurturing environment, with the ultimate goal of being able to hold on to some of the best and brightest minds in this city. One of the key factors in seeing that vision to fruition rested with the incorporation of Winston Starts. Part of Winston Starts’ mission is to provide affordable space and business coaching, with incubating businesses starting on the 4th floor and later-stage businesses located on the 5th Floor. The textbook model would involve a local innovator to start on the 4th floor, move up to the 5th floor, and then eventually move out into their own space in Winston-Salem once they have a successful business model. 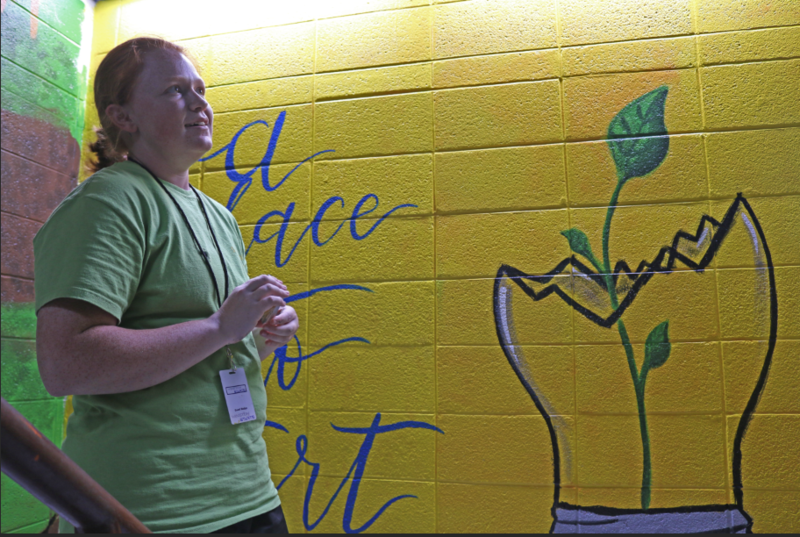 And with those three words, along with the assistance of other students from Wake Forest, Winston Salem State, UNC School of the Arts, Forsyth Country Day and Reynolds High School, Vecellio began her mural. A Trinity native, Vecellio grew up in the area and her aunt attended Salem. She chose Salem College over other art schools because she said she knew Salem would offer her more freedom. She graduated in May with a double major in Studio Art with an emphasis on painting, as well as Art History. As an artist, Vecellio said she’s keeping her options open. The future may include graduate school, but eventually, she said she would like to have her own business, possibly even as a courtroom artist. She said the business experience she has received in pitching her stairwell mural has been invaluable. Vecellio’s inaugural mural marks the launch of an ongoing stairwell student art project, Winston Arts. The plan is to bring students from high schools and universities across the city to transform the rest of the flights in a way that showcases the varying objectives and missions of the other floors. It was exactly what Vecellio had hoped for with her “startup” mural — once the seed is planted, who knows what the future holds.